Make an Outright Donation online today! With a minimum donation of $50 to the Susan Fazio Foundation, we would like to send you "The Susan Bracelet" as a thank you. 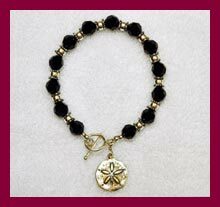 The bracelet is custom designed and handcrafted of black Swarovski crystals and fine sterling silver. To receive your bracelet, make a donation, then complete this online form or download a PDF and mail. The success of The Susan Fazio Foundation for Melanoma Research's mission of "Help and Hope against Melanoma" depends on the generous support of donors like you. Your gift will enable the Foundation to fund critical melanoma research and educational activities for patients, family members, healthcare providers and the general public. Gifts of cash, usually in the form of a check, are the most popular way of giving. You can make this gift specifically for research or education or for a specific program of the Foundation. You can send a gift in memory of someone or in honor of a special day in someone's life (e.g., birthday, anniversary, graduation, retirement). The Foundation will acknowledge your special thoughts to the person's family or to the person honored. Donors contributing stocks or securities to The Fazio Foundation not only avoid capital gains taxes, but may claim the full current market value as a charitable donation. It is advisable that you discuss such a gift with your tax adviser. Providing for The Susan Fazio Foundation for Melanoma Research in your will can have significant federal and state tax advantages to your estate. It is advisable that you discuss adding The Foundation to your will with your attorney. During the year The Foundation sponsors events and activities and invites your participation. We will notify you of these events and activities and have details on our website. Or you might be willing to undertake a fundraising event with the proceeds coming to The Foundation.